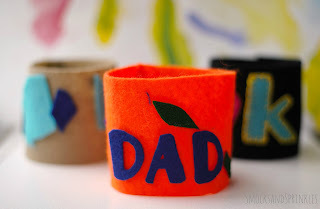 When your little one has the attention span of a goldfish and you want to do a craft, you have to be fast. 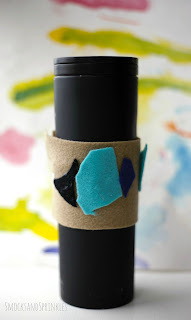 Today's felt coffee cup cozy craft (say that five times fast!) 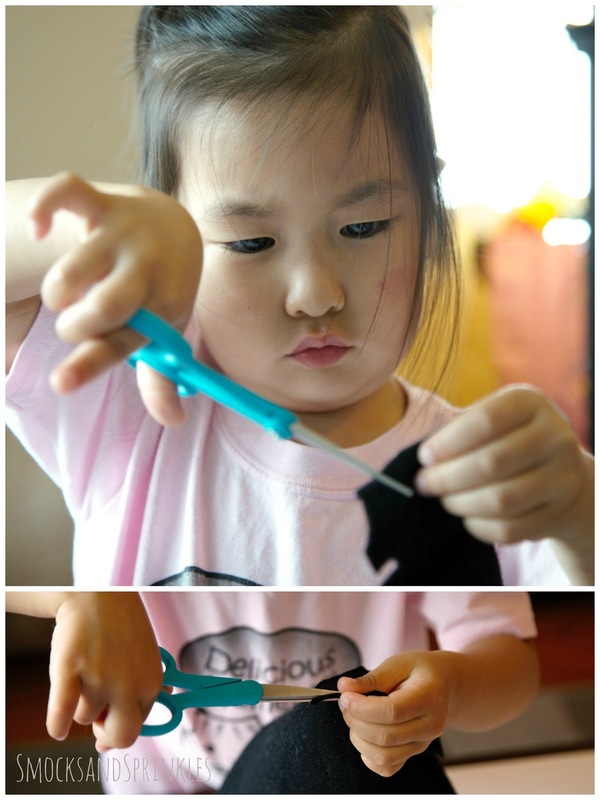 takes no time at all, and your toddler can do most of it independently! 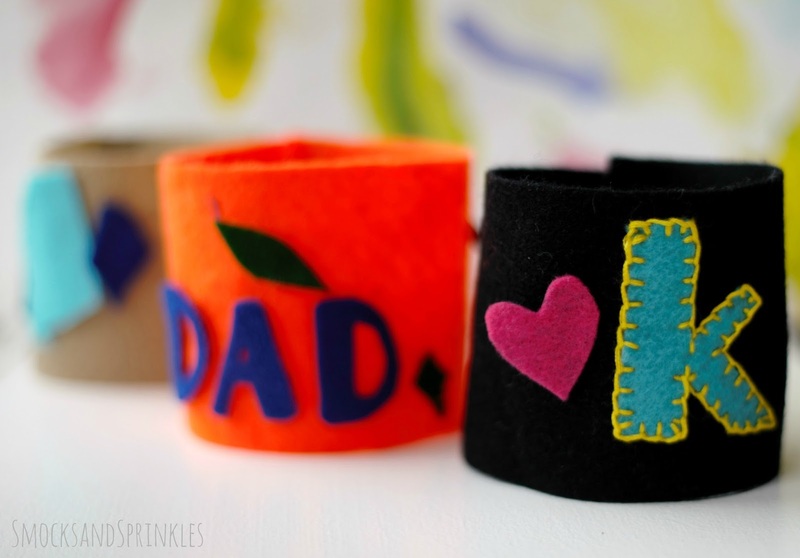 It's totally customizable, and you can make it as complicated or as simple as you like. 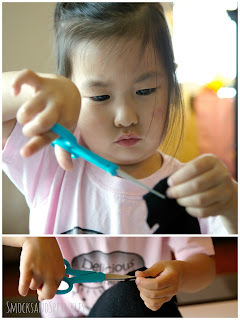 I let my almost 3-year-old do whatever she wanted with scissors, felt, and glue, and you can see the results. I can't say she has the most amazing colour aesthetic, but she had fun, and it's a practical gift that won't clutter up a desk. Cut out a long rectangle for the base of the cozy. Mine measured 8 cm x 23 cm (this measurement will change depending on the size of the mug you want the cozy to fit). 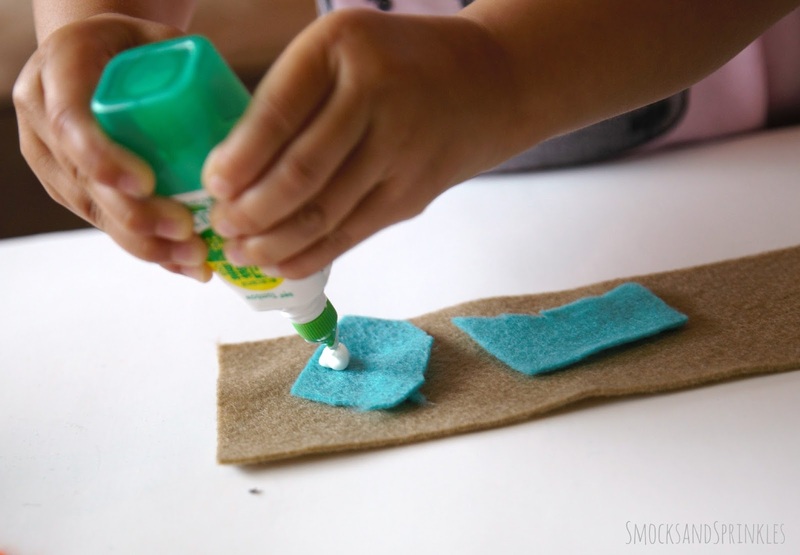 Let your little one cut out shapes out of felt. Put some glue out on a plate, or let your child squeeze glue onto the felt shapes and adhere to the base. Grab your cold coffee and throw your feet up here. You get a 5-minute break while your child cuts and pastes! Once all the shapes have been stuck down, glue the ends of the base together to form a loop. You can wrap the cozy around your mug so you know what size to make it. Tip! 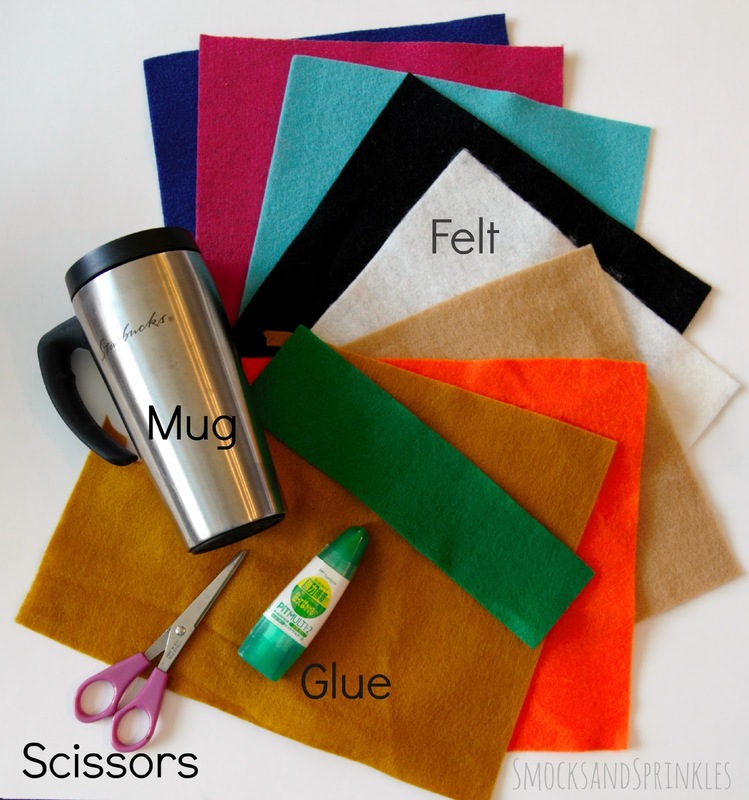 If you want your cozy to be somewhat colour-coordinated, limit the colours of felt you put out. 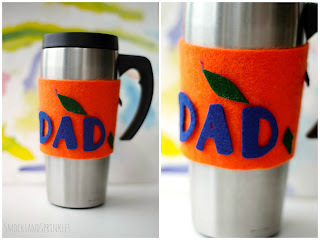 Okay, and because I just can't leave some things alone, I decided I wanted to make my own cup cozy. It's the same idea as the one above, but I drew and cut out templates from paper first and then cut them out of felt. I also decided I'd blanket-stitch the shapes at 1 am because I'm crazy for crafts. And alliteration, apparently. It's a problem. But it was worth it! 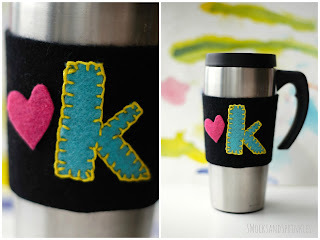 I love blanket stitching! 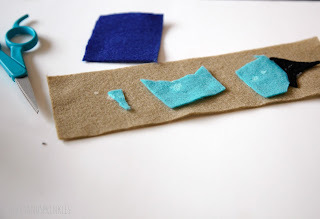 Check out this link if you want to learn how to blanket stitch. Tip! 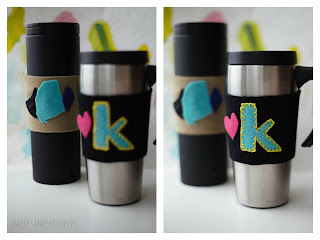 To get nice lettering, you can print out the words in the font you want and use the paper as your template. Nancy and Michelle are two best friends and crafty mamas on an incredible (and unpredictable) adventure raising children and making sure we have loads of fun at the same time. 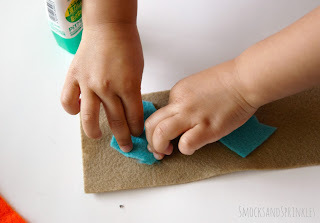 When we are not busy changing poopy diapers or responding to the irrational demands of our sweet toddlers, we try to sneak in some time to craft our little hearts away. 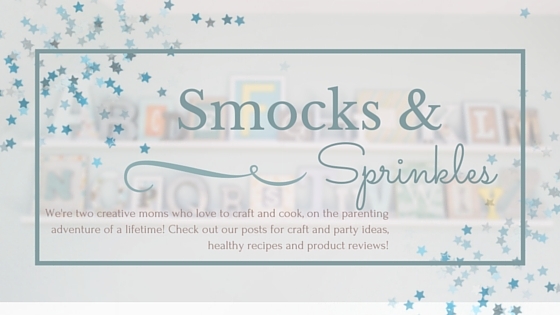 So grab your smock and join us on our creative journey!